I have a few scattered days off during the last few weeks of 2010. I had a little holiday to use up. 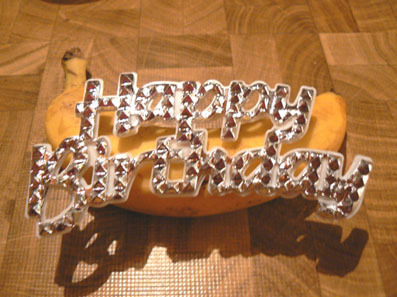 I tried to use it smartly. My mum and dad came up for a short visit just before Xmas and stayed until the Monday. We decided to spend a few hours of the extra day at Tropical World. We've been before, but it remains a good (and warm: as much as +28°C, a change from the -5°C outside temperature) place to spend a little family time. And Olive hasn't been since just after she started walking, so over a year ago; she's much more aware and interested in her surroundings these days. Afterwards we went across the road to the Roundhay Fox for lunch. The food is good there, but the service is usually lacking. On this occasion, it took me twenty actual minutes to place our order at the bar. Then, they forgot Olive's meal. Last weekend we went to Halesowen. It turned out to be a busy couple of days. We decided to drive down on the Friday, and set off at 6pm. The journey normaly takes about two-and-a-half hours. Due to numerous minor accidents, we only pulled into my mum and dad's drive at 11pm. Next day, we made use of our free return tickets to the West Midlands Safari Park. It seemed that plenty of other people had the same idea - at times it was like sitting in a two-lane traffic jam, with the dubious bonus of being surrounded by Giraffes, Camels and all brands of Deer. We didn't bother with the rides this time, and didn't really take any pictures - click here for images from our visit in July. Grandma and Granddad Smith's main present was tickets to see In The Night Garden Live, which is touring the country and had arrived in Birmingham's Cannon Hill Park. I didn't know exactly how the thirty-minute TV show would translate to an hour-long stage show. The answer is: really well. A mixture of puppetry and costumes, a minimalist set, and a restrictions to the audience size for each show conspired to give us a neat, simple and well put together extended episode. All the children in the room were engrossed. There were even a couple of Night Garden groupies in the audience; one girl (who must have been about three or four) was wearing an Upsy Daisy outfit. I just read a wonderfully interesting and slightly gruesome article on Mental Floss about parasites that turn their hosts into 'zombies'. The piece links to films of the parasites in action. My favourite two are Leucochloridium Paradoxom (above), which persuades snails to offer themselves as dinner to birds, and Glyptapanteles (below), a type of wasp that lays it's eggs inside caterpillars. Via the use of a virus that has been genetically modified by the wasp, the caterpillar acts as mother, food and bodyguard for the young. what we did on our holidays, day four - wir haben alle typen verwittern lassen, haben einen gelato gegessen, und haben ein italienisches flair erfahren! 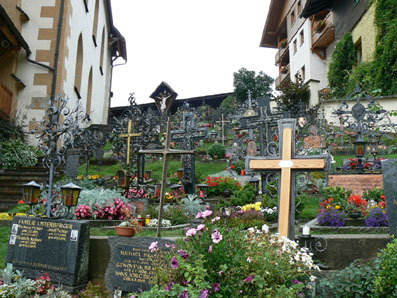 whilst in zell am see yesterday, we booked a trip. a coach trip. in my head, i associate coach trips with old people. but i think this is more the case in the uk; within europe, i think (i hope) that it is a little more cool for a group of twenty- and thirty-somethings to sit on a coach as it winds it’s way towards the highest mountain in austria (second highest peak in the alps), listening to a bi-lingual commentary. although it was raining hard again today, we reasoned that our coach would keep us relatively dry. 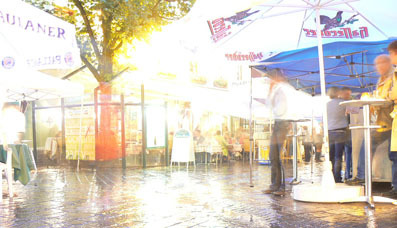 we caught a lucky break in the rain when we walked down to the bus stop, and our luck held in that at the bus station in zell am see there was a coffee shop that was open at this early hour. the coach was a double-decker, and although we nearly clambered aboard the wrong vehicle, which would have led to a day of finnish commentary, we managed to settle back into our comfy dry seats, and watch town become suburbs become hamlets become fields. very soon, we were climbing. the rain continued, and occasionally we found ourselves actually within the clouds. when we emerged from these, the views were always spectacular. the grossglockner high alpine road was constructed between 1930 – 1935, and gave employment to around three-thousand austrians during the depression. the road, which officially runs between fusch and heiligenblut, is 48km long, and rises from 805m to 2504m above sea level. it is always closed from the end of october until the beginning of may, due to snow (which is no longer cleared by hand). 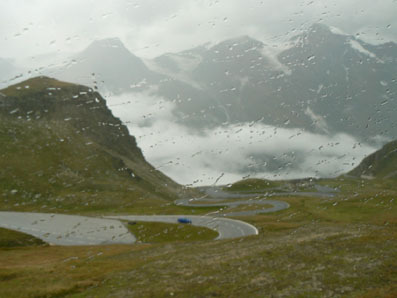 the road passes through the hohe tauern national park, at the centre of which is the 3798m grossglockner mountain. we disembarked, and boarded a postbus, travelled about ten feet up a short hill, and disembarked for the second time in as many minutes. we trudged through the rain to the visitor centre, where we took pictures of posters and generally larked about, perhaps buoyed on by the thin air. 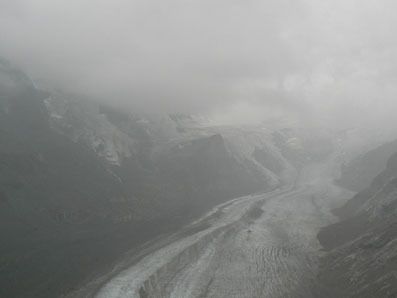 cloud completely obscured the grossglockner, although we were just about able to view the 9km long pasterze glacier. i returned to the coach a little early; i had received a text from my mum giving a phone number of thompsonfly’s lost luggage department. I managed to get through, and spoke to an unsympathetic voice that informed me that my bag had been located and would definitely reach me that evening. ‘mmm, we’ll see’, i thought. now we descended to the afore-mentioned town of heiligenblut, where we were advised to take pictures in and around the pretty church. we did, and the sun came out. we pressed southwards, to the medieval city of lienz. being close to the italian border, our guide told us we simply must sample the local ‘gelato’, and soak up the ‘italian flair’. i had a gelato, and bought a t-shirt. lienz is the only place in austria where i saw a shopping mall. we returned to zell am see via a different, lower route, and once there (and at length) we plumped for a suitable looking restaurant, complete with wise-cracking waiter. there was an outdoor music festival in town this evening; small bands played short sets, before rotating their location, so all could have a chance of hearing a variety of music. we were treated to a two-piece jazz-guitar-trumpet-singer combo, who played a couple of numbers. they were stopped in their tracks when their amp blew up, the cause of which was surely the thunder storm which was now dumping lots of rain onto the town. we remained at our table, in the relative shade of the restaurant canopy. when there came a break, we dashed to the taxi rank, and, having analysed the previous day’s transaction come to the conclusion that austrian taxi’s probably do charge per person, agreed to pay 42 euros to be driven to our real door, behind which sat my bag. hallelujah! indoors, out came a secret chocolate cake, which both served as pudding and symbolised chistina's birthday, which was today. you've probably already seen this story by now, but it is still pretty crazy to think that a 20ft long whale has made it's way into the river thames. i hope it finds it's way out now it has seen the sights. 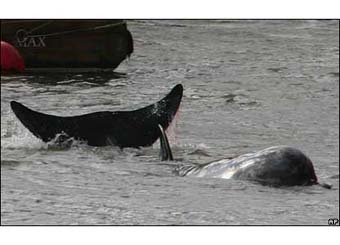 update (21/01 8.07pm) - the whale has sadly died, during attempts to rescue it from the river. normally, i step into the shower before i am fully alert, rubbing the sleep from my eyes. 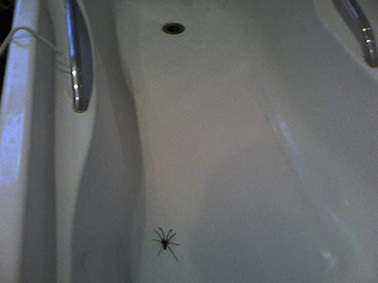 good job i looked this morning, or else i would have been sharing my morning hygiene routine with this fellow. see how it is the same size as the plughole! plus, it could jump! the one thing worse than a huge spider is a huge spider that thinks it's jonathan edwards (or jonathan edwards, or even jonathan edwards).